One of the most exciting bands emerging from Scotland is The LaFontaines. The four-piece deliver a unique sound that fuses the guitar swagger of Kasabian, with the edgy hip-hop delivery of The Streets and the electronic-pop undertones of twenty one pilots. Their 2015 debut album Class reached No.1 on the Indie Breakers Chart as they went on to tour with Anderson .Paak, Twin Atlantic and All Time Low as well as performing at major festivals including Reading & Leeds, Download, The Great Escape, T in the Park, TRNSMT and Reeperbahn. Last year, they released their sophomore album Common Problem to critical acclaim and were hailed the "Kings of The North" by Kerrang!. 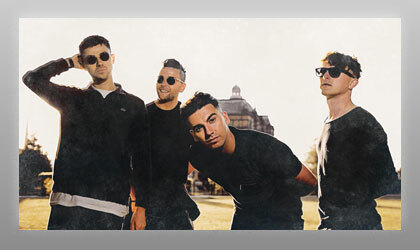 This year, the quartet spent two months touring as the main support for Don Broco across the UK and Europe, they performed a a number of festivals, followed by a UK and European tour.